Biosis 23: Priorities, Teeth Clenching & Grinding, Body Mend - Gary M. Verigin, DDS, inc. Gary M. Verigin, DDS, inc.
What a year we have had – interesting, scary, exciting and very historic! We have a brand new president, and we can be proud of how our nation continues to evolve out of many years of bigotry and violence. To me, that in itself signals hope! We should not let our fears hold us back from pursuing our hopes. Ask yourself: Are there ways we can make something positive out of less than positive situations? 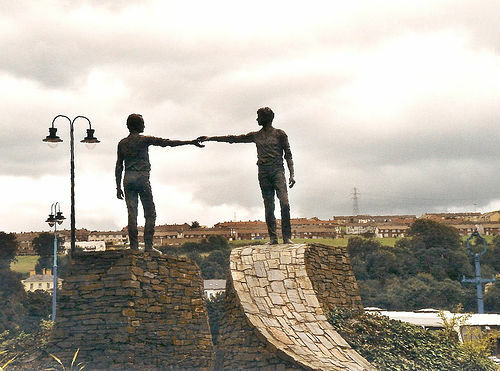 We can start by reaching out to each other. For we all know that if we stick together, the hard stuff gets easier to figure out. Most businesses are seeing a downturn. Ours is no different. And yet, slowing down a bit has its benefits. It can let us focus and understand what’s really important. Here at the office, we can spend more time with each of our clients – listening to them, supporting them, caring for them and providing information that enables them to enhance both their dental and systemic health. Some feel stress about the upcoming holidays, especially the financial aspect. But do we really need to spend a lot of money to cherish our holidays? No amount of money or gifts can take the place of gathering with family and friends, or sharing our time and talents in caring for those less fortunate. Not many of us need any more “stuff.” We do need family. We need friends. We need to love others and be loved. After Christmas, our days are lazy and relaxed. No shopping for us! But we do begin thinking of the new year that is about to dawn. What lies ahead? How will things work out? What new things will we learn? What new friends will we meet? I am always excited. How about you? Have a wonderful holiday season and a fantastic New Year! P.S. Be sure to click on both of the links above! …you might want to think twice about using them before the year is through. If you’re paying your premium, you should get what you pay for. If you don’t have dental work that needs to be done, you still should have regular cleanings and exams to prevent the need for extensive treatment later. Two visits a year is ideal, though if you have gum disease, more frequent cleanings are recommended. Your deductible doesn’t roll over. If you don’t meet it this year, you have to start over from scratch the following year. Give us a call at (209) 838-3522 to arrange to use your benefits before 2009 arrives. These days, we’re seeing a lot of news stories that imply an increase in teeth grinding and jaw clenching due to stress from the current economic meltdown – almost as if these were relatively new phenomena. But actually, the story of grinding and clenching goes all the way back to ancient Mesopotamia, where the Sumerians developed an advanced civilization between 3500 and 3000 BCE. Much of our knowledge of Mesopotamian medicine and dentistry comes from clay tablets inscribed with their cuneiform script which the Assyrian King Ashurbanipal saved in his royal library. Several were devoted to the diagnosis and prognosis of diseases, and these tells us that dental conditions were a major means for charting the development and course of various illnesses. Teeth grinding, they said, indicated that the disease would last a long time. If the grinding was continuous and the person’s face was cold, they believed that the illness was caused by the goddess Ishtar. Overall, the Sumerians considered teeth grinding to be very dangerous, and their remedy for it was one that today would be considered mystical and magical. The grinder would place a human skull on a chair in their home and leave it there for three days. Sacrifices were placed on the chair morning and night. The individual would kneel before the skull, speaking prayers into it and kissing it seven times each before going to sleep each night. To date, thousands of ancient human skulls with extremely to severely worn teeth have been unearthed by archaeologists in this region and are on display in numerous museums throughout the Mediterranean Basin. But the Sumerians weren’t the only ancients who told us of grinding. For instance, there are several biblical references to it, including Jesus’ familiar description of the fate of heaven’s outcasts: “There will be weeping and gnashing of teeth” (Matthew 8:12). The only time teeth should come in contact with each other is when you swallow food, and even then, that contact should be fleeting. If your teeth are touching at other times for more than one second, you are putting them under undue pressure. This pressure can build even through basic actions such as swallowing. Think: we swallow at least twice a minute when awake and once a minute when asleep – thus, thousands of times each day. If the teeth make contact with each swallow, they are put under enormous, cumulative pressure. It is impossible to tell how many people habitually grind, clench and brux (gnash) their teeth, and those who do often aren’t sure if they do or not. This is because they’re usually doing it subconsciously. Often when a new client fills out our dental questionnaire, more often than not, they do not answer “yes” to the question of grinding, clenching and bruxing. The only way I can tell if it’s an issue is to look at the occlusal (biting) surfaces of the back teeth, as well as the biting edges of the front teeth and tips of the cuspids, or “eye-teeth.” If they do grind, the usual anatomical, morphological or topographical features are worn down, or the front teeth will show some chipping or flattening. 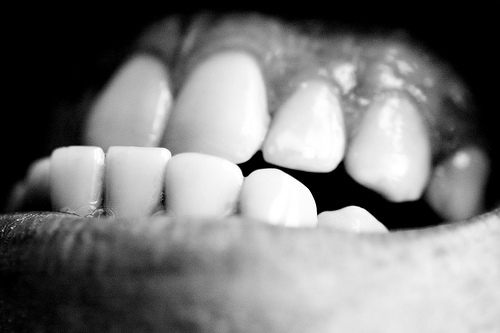 People who clench their teeth rather than grind usually will display other characteristics. Those who display compression of the teeth generally show wedge-shaped defects at the neck of the tooth where the root meets the crown – a stress-vulnerable area. This is because, as the teeth are compressed, minute particles of tooth structure break away. (The technical term for this is abfraction.) We also commonly see dimples on the biting surfaces of the back teeth. Their highly polished appearance – along with the formation of tori (bumps of bone) in the palate – is the result of the piezoelectric effect. When the teeth and bone are compressed, both negative and positive electricity is generated. Negative ions are said to stimulate bone growth. However, in areas of high stress, positive ions are emitted, and these carry particles of tooth structure with them. This phenomenon may be the reason why some people complain of a metallic taste in their mouths even though they do not have any metal fillings in their teeth. In severe cases, some clench hard enough to actually rearrange the molecules of dental materials in their mouths, forming wavy lines on the teeth like those on a washboard. Sometimes this can happen even in natural teeth. There are a variety of reasons why individuals may clench or grind their teeth. Mental/psychological stress factors are one of the main culprits. JoAnne mentions some of these in her column above, and I doubt any of us would have much trouble coming up with our own lists of specific stressors in our lives. Anymore, stress is often the rule rather than the exception, and as such, it is a contributor to a vast number of chronic illnesses, diseases and dysfunction – including clenching, grinding and bruxing. But there are causes beyond stress, as well. For instance, those who have an uneven bite often clench, unconsciously trying to mill their teeth to a more comfortable dimension. Those with jobs that require heavy lifting may habitually brace their jaws while doing so, as may athletes engaged in heavy exercise or sport. In the dental literature, it is reported that people who are plagued with sleep apnea seem to clench more, as do those with chronic pain, whether in the mouth, jaw or elsewhere in the body. Some drugs – amphetamines and cocaine, for instance – have direct effects that include gnashing teeth, while the chiropractic literature indicates that clenching and grinding may be caused by low mineral levels and parasites. Successful treatment of individuals who clench and grind entails two main phases: education and appliance therapy. It is most important to provide educational material and resources to the client so they can fully understand their situation and give truly informed consent to the treatment they choose. Another key part of informed consent is getting third party verification of the condition. This allows the individual to both confirm diagnosis and garner new information from a wider variety of sources to study at their own pace. Chronic clenching and bruxing manifest a variety of different clinical pictures that present long term problems to the individual, as well as difficult clinical decisions that the dentist must make. The health of a tooth depends on the health of the dental pulpal complex. This complex is akin to the hard drive of your computer. The pupal complex is composed of a variety of delicate connective tissues, capillaries, nerve tissue and lymphatic drainage vessels. Every time a tooth is subjected to the dental drill, these tissues are stressed. Chronic clenching, bruxing and grinding cause similar forces and stresses, which reduce the volumetric size of the pulpal complex and make its tissues more collagenous. Thus, the exchange of nutrients and oxygen between the capillaries and pulpal tissues are hampered. These starved tissues eventually become inflamed. If the tooth is worked on by a dentist and its vitality is reduced, the pulpal complex can go on to dry up – a condition called tissue necrosis, literally “tissue death.” The clinical options at this point are either tooth removal or root canal therapy, depending on one’s philosophy of keeping dead tissues and organs in one’s mouth. When abfraction is the issue, there are a number of decisions that need to be made by the client and dentist. Imagine a regular, yellow, No. 2 pencil. 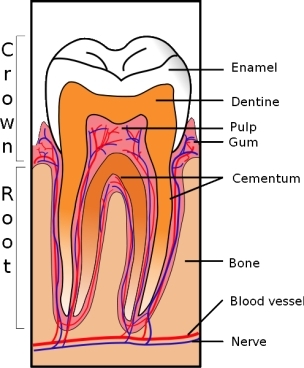 Its size is just a little larger than that of a molar root. Now imagine taking out a pocket knife and making a notch on the side of the pencil. How far can you carve before you run into the pencil lead? Notches in teeth due to abfraction can become similarly deep over time. And when they get deep enough, the roots of the teeth may become sensitive to brushing and eating. One option for repairing this damage is filling the notches with composite material. However, the longevity of such fillings is limited. Sometimes the client may be referred to a periodontist for tissue grafts, working on the assumption that the tissue around the root will no longer recede. But continued clenching will certainly encourage recession. So this alone is not a sufficient treatment. In some cases, the best treatment is to restore the tooth with a porcelain crown, lowering the margins below the gum line. That said, it is important to limit repeated work on the teeth – work that will be needed if good, informed decisions are not made in the first place. The dentist must always try to protect the dental pulpal complex from further abusive stresses, whether they are caused by the dentist’s work or the client’s unconscious habits. Educating the client about managing their stress overloads must be addressed in conjunction with appliance therapy. Reasonable levels of stress experienced intermittently help stimulate the immune system, the psyche and the basic regulative system. They help keep one alert and well functioning. This, according to pioneering researcher Hans Selye, is known as eustress, or good stress. Negative stress, on the other hand, he called distress, which he found to weaken the individual and worsen health. The regenerative processes are undermined, and this helps speed the aging process. It also negatively affects the health of the dental pulpal complex. In order to decrease the degenerative process to the teeth, the use of dental splints is the best insurance policy a client can invest their money in. But what kind of splint? Should it be placed on the upper or the lower arch, or both? Should the material be hard or soft or semi-rigid? Should it cover the full arch or just the front teeth? Should the lower jaw be positioned where the client bites, or moved backward or forward? Unfortunately, there are a variety of opinions and conflicting studies. The opinions are determined by the various universities across our nation and depend on who chairs the various departments in dental schools. There are also individual clinicians across the country who propose a variety of techniques and opinions that they develop in their own clinical practice, who speak at various annual conferences or at different organizations that specialize in these types of issues. Since there are numerous techniques available to the treating dentist, what is the client to do? First, the client needs to consider how thorough their examining dentist is. Is the dentist reluctant to discuss various concepts, or does he or she provide you with a variety of thoughts and a wealth of material and resources for you to explore so that you can develop your own great game plan for your betterment? In other words, will your dentist work with you and allow you to develop a game plan with them instead of dictating your fate? Meantime, until there is a consensus regarding clenching and grinding, you can follow this simple rule of dental health fitness: keep your teeth apart! The Cascade Crest 100 Mile Endurance Run is one of the most grueling such races in the US. 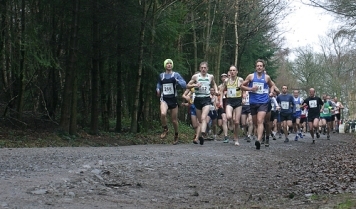 The field is 100 runners strong, and the allotted time to finish is 32 hours. It has a well-deserved reputation as one of the toughest yet most scenic 100-milers in all the country. The start and finish are in Easton, Washington, and the course has so many elevation gains that, running it, you begin to wonder if you aren’t really summiting Mount Everest. The trails – when there are any to be found – are single track, and most of the run is on scree. My desire to run this race was inspired by the course description and the challenge it presented. Unfortunately, one week before the event, I started to experience some pain in my groin on the right side. I visited the doctor, who said that I most likely had pulled a muscle in the area. I decided to run anyway but while using the homeopathic remedy Body Mend. I had already started taking it the week before – one complete dropperful three times daily. By the third day, my pain had subsided, and I was feeling good through my final preparation for the race. I usually don’t do any type of running during the week before a 100. Slight, daily, one mile walks are how I keep my body going through that week before a race. Race day. I made sure I had my Body Mend with me, and after every four hours, I used it. Early on, I did feel a pain in that same area, but it was a pain I felt I could endure. At Mile 20, I was still going strong, placing somewhere in the top 20. At Mile 30, the pain was beginning to intensify, but continuing to use the Body Mend, I was able to keep on. Twelve hours later, at Mile 40, though, I was sure that I was no longer dealing with a pulled muscle. So I did the only responsible thing I could: I pulled out of the race. But I continued to take the Body Mend. Two days later, the doctor diagnosed the source of my pain as an inguinal hernia. I continued to take Body Mend up to and after the day of my surgery. I had an amazingly speedy recovery. I was able to return to work only five days later, and now eight weeks later, I can walk a mile a day, all while still using Body Mend. I strongly believe that this remedy assisted in the minimization of soft tissue damage and increased the rate of healing. To learn more about Body Mend, contact our office at (209) 838-3522, or just ask us about it at your next visit. For more health news, tips, video and more, visit our blog, Know Thy Health.